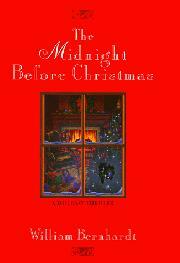 Midnight?—it’s the Black Void—though Christmas is notorious for family rages. Here, Bernhardt, who usually writes legal thrillers about Oklahoma-based attorney Ben Kincaid (Naked Justice, 1997, etc. ), focuses on Oklahoma City’s own Carl Thomas, a big, violent, alcoholic cop suspended from active duty who’s been divorced by his wife, Bonnie, and banned from seeing his son, Tommy. But on Christmas Eve a drunken Carl beats up Bonnie’s new boyfriend, Frankie, splinters her front door, and slams his fist through its window. So Bonnie jams his fist upward, “impaling it on a jagged piece of broken window glass. Pain coursed through Carl’s arm, then his body, like the ripple of sheet lightning . . . .” When Carl vows that he’ll kill seven-year-old Tommy, rather than be parted from him, Bonnie goes to see lawyer Megan McGee for an emergency restraining order. So Carl picks Tommy up from school and takes him to Toys “R” Us for a Mighty Movin’ Dino-Fighter before removing him from his mother’s grasp. Bonnie really is evil, however, and has inveigled Frank into shooting Carl, who has a big trust fund coming to him at 40 and has willed it all to her. But, gosh, somebody has tried to kill Tommy with rat poison in his Chinese dinner. . . . Jolly Christmas fiction for the whole family.